Just in before the deadline, here is my entry for the Blogger's Quilt Festival at Amy's Creative Side. This is my Silo quilt, and it's one of my favorite quilts that I've made to date. 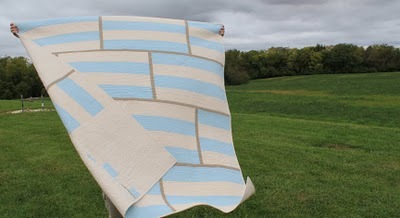 You may remember that this quilt was inspired by a large, metal silo that sits on a farm about ten miles from my house. I've probably driven past that farm hundreds of times before, but one day last year I saw that silo in a new light, and I grabbed my sketchbook and pencil and began drawing. 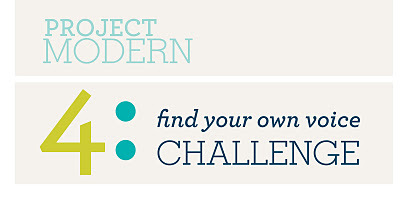 I created the quilt for the fourth part of the Modern Quilt Guild's Project Modern, where the theme was to find your own voice as a modern quilter. That project was judged by none other than Denyse Schmidt, whose work I so greatly admire. 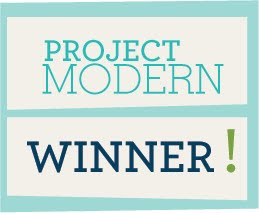 I was incredibly honored when Denyse chose my quilt as a winner, and said, "This quilt is beautiful and striking in it's clear simplicity and strong execution. 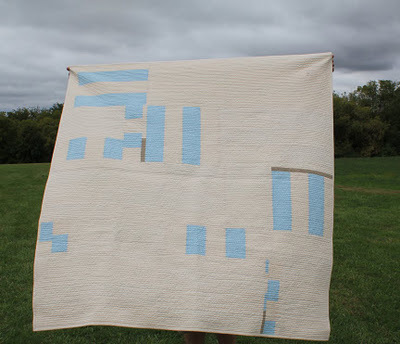 The translation of the idea/inspiration into a quilted medium feel spot on, and every choice the quilter has made--from palette, to structure, and quilting--supports this clear vision and intention. I'd love to see the back!" I'm still amazed, and honestly a bit in awe, every time I read those words from Denyse. That was the real prize for me, and was well worth more to me than any of the other physical prizes that accompanied the win. And here's a shot of the back, for her and for you all to see. The back of the quilt is very improvised, and I used leftover pieces from the blocks on the front and a lot of cream as well. My Silo quilt measures 64" x 67" and was designed, pieced, and quilted by me on my domestic sewing machine. I used only solid fabrics in the quilt: a creamy white, a pale blue, and a taupey gray. I quilted it with heavy straight line quilting, with the lines of stitches running horizontally across the quilt roughly a quarter inch apart, to echo the linear repetition of the grooves of steel on the silo. 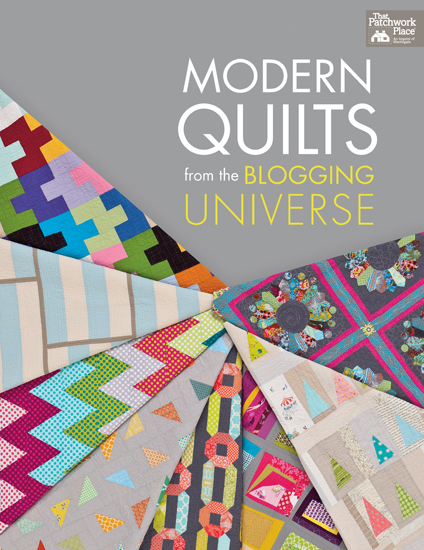 My Silo quilt is also featured in the upcoming book, Modern Quilts from the Blogging Universe, published by Martingale, and even made it to the cover! I'm so excited about this book, which will be available in December. Per Amy's request, we're supposed to categorize our quilts into a theme listed in the Blogger's Quilt Festival, but I honestly don't know where this one would fit. Although I don't consider it an art quilt at all, perhaps that would be the best category for it, considering its inspiration. But since this quilt is completely functional, and I don't typically think of art quilts as being functional, I'm not quite sure. I suppose it could also be in the favorite quilt photographer category, because I'm really quite pleased with the photograph of the front of the quilt that I shot, which is shown above. Any suggestions on where you think it may belong? Thank you again to Amy for all of her hard work on the Blogger's Quilt Festival. 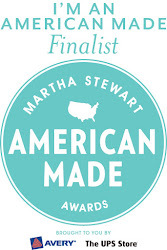 Please be sure to check out more of the amazing quilts and be prepared to be incredibly inspired by them all. Lovely!! And I love the inspiration, that's so clever! Plus, I'm a sucker for those colors. I love them. It looks so good! this is such a beautiful quilt, everything about it is simply perfect! Love the story of your quilt's inspiration. I just got back from a quick trip back to the midwest and my uncle's farm. 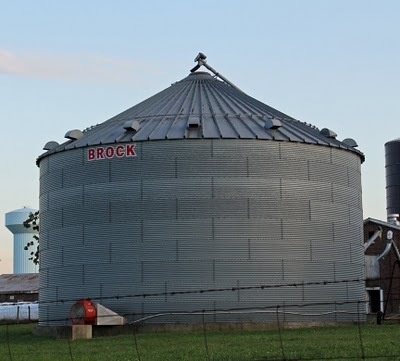 Silos silos silos everywhere. Had to rush to get my own festival entry up at the last minute. Love your quilt and all the work that went into designing it. Thank you for the story. I'll vote for you! Wonderful quilt - and great inspiration! I'm from Saskatchewan so I see silos all the time. I'll be seeing them much differently now - thank you! Heather, did you get it linked in time? For the categories, maybe Favorite Throw Quilt (since neither dimension is over 70"? ), Favorite Home Machine Quilted Quilt, and Favorite Two-Color Quilt (even though it's 3 colors, the gray might be considered sashing? Just a thought). I don't really get the Favorite Quilt Photographer category. Is there an explanation of the categories anywhere? I love this quilt, Heather! It's so fun to see where the inspiration for quilts come from. So cool!